The young royals descended en masse to their favourite haunt Mahiki on Dover Street organised by MPs son Henry Conway last night - as Princesses Beatrice and Eugenie were seen with their cousin Prince Harry for first time since his return from active duty in Afghanistan. But thankfully, there was no sign of any over-exuberant, rowdy behaviour, as the royals left in an orderly fashion, with no need for a helping hand. 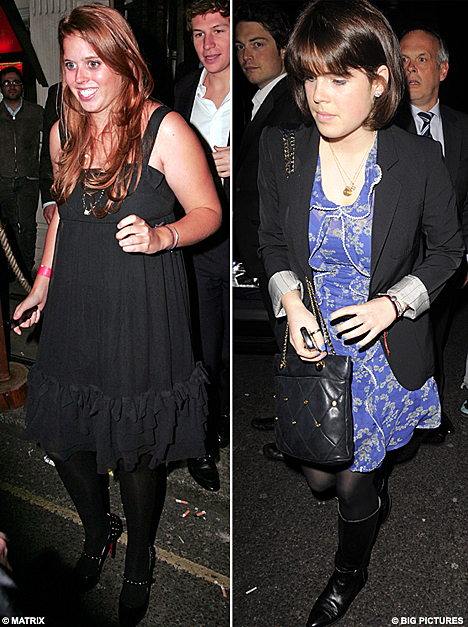 Princess Beatrice, was seen leaving the club in ritzy Mayfair, dressed in a black ruffled dress and sundress, and studded Christian Louboutin heels, ideal for showing off her suntan. The 19-year-old princess has just got back from a two week'backpacker style trip to Thailand. 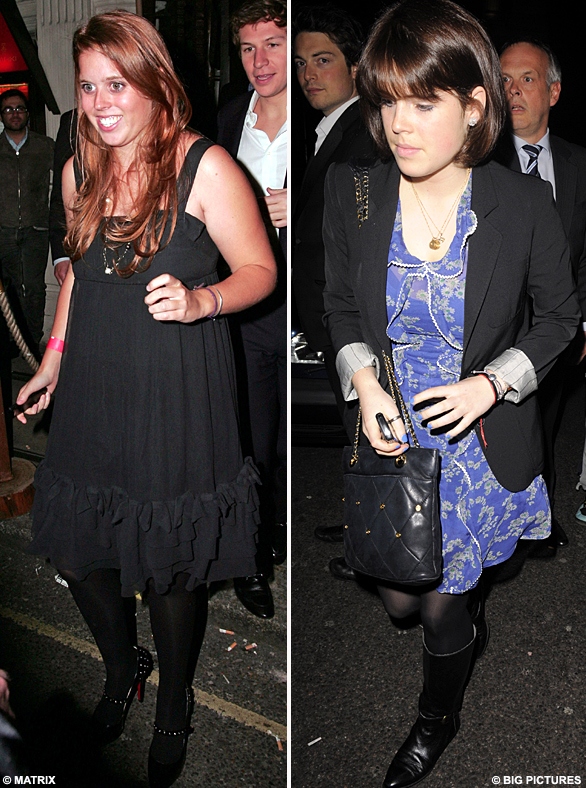 Meanwhile her trendy young sister Eugenie, 18, wore a floral print cornflower blue dress from model Kate Moss' Topshop range, with matching nail polish, and flat boots. With her brunette hair cut in a fashionable Katie Holmes style bob, Eugenie, fresh from a cover shoot for Tatler magazine, is emerging as the trend-setter in the royal pack. And fittingly, Eugenie is said to have a host of admirers at £26,000-a-year Marlborough College, where she is a straight-A student studying for A levels in Art, History of Art and English this summer. Earlier, Harry, 23, was seen with his brother Prince William, and his girlfriend Kate Middleton, attending a charity event in Wilton's Music Hallin London, but he later left them to join his cousins at Mahiki, arriving with his royal protection. Thursday nights are organised by flamboyant Henry Conway - the son of disgraced MP Derek Conway - who is beginning to develop his own following. The music was provided by DJ Tom Crane, the boyfriend of Girls Aloud singer Sarah Harding, and we can reveal that the royals were dancing to an eclectic mix of anthems - from Motown to Estelle and Mariah Carey. Earlier in the day the group were together at a function in aid of close friend Henry Van Straubenzee, who went to Ludgrove prep school in Berkshire with Harry. Van Straubenzee was tragically killed in a car accident during his gap year. The charity do was organised by Jamie Murray Wells, an entrepreneur who owns online retailer Glasses Direct. Henry Conway said: "It was quite restrained because of the charity do beforehand. Everyone was on their best behaviour, but Mahiki is always fun." The young royals were in a private VIP area downstairs in the club, and were drinking champagne, cocktails and the famous Treasure Chests - a variety of shots topped up with a bottle of champagne and drunk through several straws. Other guests included Isabella Anstruther-Gough-Calthorpe, who is the girlfriend of Sir Richard Branson's son Sam, and Sir Richard's daughter Holly (who looked eerily like Harry's absent girlfriend Chelsy), and WAG Charlotte Mears - who looked a little lost. 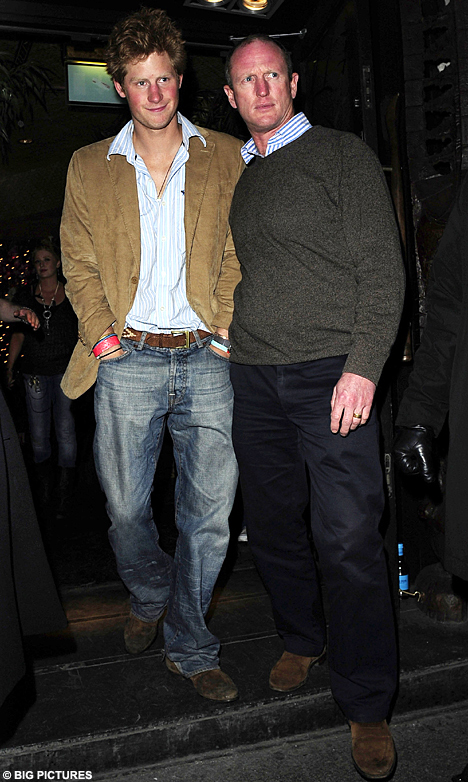 And - as always when the young royals are partying at Mahiki - Guy Pelly was also on hand. But last night there was little sign of any overindulgent behaviour as the group - including Beatrice's American boyfriend Dave Clark, left looking rather sober. Both Beatrice and Harry looked glowing after enjoying sunshine breaks abroad. 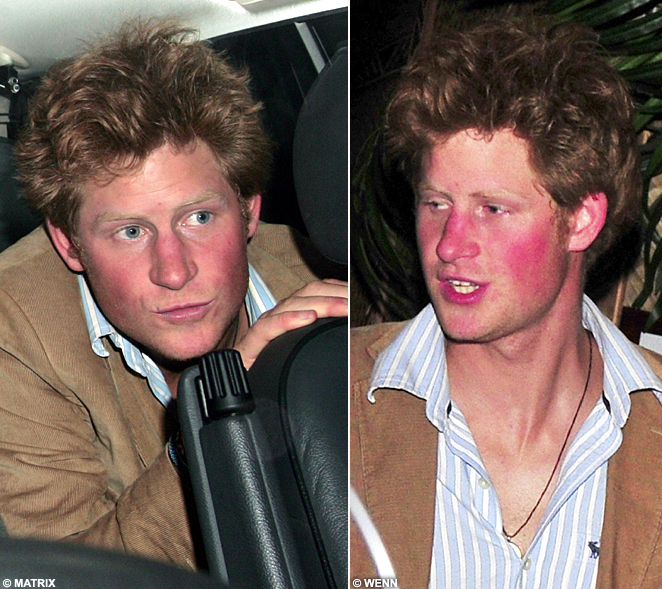 Harry has just returned from spending time in Cape Town, South Africa with girlfriend Chelsy Davy, 22, and her family. But Chelsy was back at university in Leeds. Beatrice, who is halfway through her gap year, is clearly enjoying her freedom before settling down to studying a textiles and design course at Goldsmiths College in September. She is set to leave for the Big Apple soon to do work experience with a fashion magazine. Those two girls are so unique looking. A great haircut and color could work wonders - so would Beatrice keeping her horsey teeth behind her lips. "Oh typical James. Can't even stay awake for your own movie. But it's not your movie, it's really my movie. Hi. I'm Michael Alig. " I think Kate Middleton is so pretty. If she marries into the royal family, she looks to class it up a tad. God, they can be so funny looking! Not the best pictures - of any of them. Yikes! My my, didn't we all just dip our tongues in some acid today.